Today I want to share four specific actions I've taken to try to be a proactive homeowner. A great place to start with home improvement is to find (or create) a regular maintenance schedule. While you'll definitely have projects specific to your own house (about which more in a moment), there are certain chores that ought to be done on a routine basis. Here in Oregon, for instance, gutters should be cleaned both at the start and the end of the rainy season (late October and late April). Spring is a good time to wash windows, inside and out. It's also time to clean and set up outdoor furniture. During the summer, I like to trim trees and shrubs back from the side of the house. Fall is a good time to inspect the attic and crawlspace. To create our maintenance schedule, I started with this home maintenance checklist [Google Doc] based on an article from The Art of Manliness. I tweaked the document to fit our needs, adding and removing things specific to our home. While it's helpful to have a general maintenance schedule to remind you of regular tasks, it's even more important to keep an up-to-date to-do list that's specific to your home. 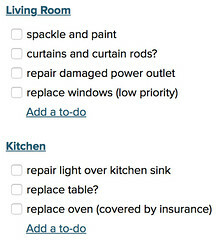 I keep our to-do list in Basecamp, a web-based project-management tool that I already use for other projects. (I've heard good things about Asana too, although I've never used it.) You might keep your to-do list in a spreadsheet or even a spiral notebook. I went through the pre-purchase inspection report and added every problem the inspector had flagged. Some of the stuff he noted was minor. In these cases, I made sure to mark the task as “low priority”. Kim and I made a slow tour of our home and yard in order to catalog other projects we wanted to complete. For example, every room in the house needs new paint. Every corner of the yard needs to be weeded and re-landscaped. We refer to our to-do list constantly. Whenever we have a free weekend for home maintenance (as we did last weekend…and this coming weekend), we check the list to see which tasks are most pressing and/or most appealing. Finally — and this is important (if somewhat obvious) — whenever we find a new project that needs to be tackled, we add it to our list. By keeping our home projects to-do list up to date, needed maintenance should never be neglected. Before we even moved in to our current home, I started keeping a “home journal” to log everything we learned about the place. Honestly, it's one of the smartest things I've ever done. I keep this home journal in a Microsoft Word document. (I've uploaded an edited version to Google Docs for you all to look at.) Every time we do major work on the house, I make an entry in the journal. Every time we discover something new about the property, I make a note in the journal. Each note includes a date and the type of work done, then a narrative description giving more detail. In some cases, I document costs. Most of the time, however, we keep receipts and invoices and other documentation in a dedicated Dropbox folder, which is where the home journal lives too. This journal is mostly meant for me. From past experience, I know that I'll forget what work we did when, which usually leads to a frustrating search for documentation. With my home journal, I have all of the needed info in one place. On a similar note, it's smart to perform periodic video tours of your home and property. These are useful not only for you but also in the event of an insured loss, such as robbery or house fire. When shopping for a house, I film every home I tour. After buying and moving into a new place, I do another pass through with the camera. Going forward, I try to do a video tour about once per year. Get price quotes from multiple sources. It's smart to know what your options are even if you ultimately don't go with the lowest bidder. Seek referrals. When you're ready to hire somebody for a project, ask your friends (Facebook is good for this) and contractors you've liked in the past. I've found that good contractors know who the other good contractors are, and they're happy to recommend them. Ask for references. If you haven't worked with a contractor before, request contact info from past clients. These references will be cherry picked, of course, but they'll still give you some idea of what the company is like. Check reviews on Angie's List (or similar sites). View these reviews through skeptical eyes, but check to see if there's some sort of pattern. I've been able to rule out potential contractors, for instance, because of multiple reviews complaining about lack of communication. Searching for new contractors can be a little scary. You don't want to make a mistake by choosing somebody who's too expensive or whose work is shoddy. (Or, worse, both at once!) By maintaining a list of trusted vendors, you can reduce some of the trepidation. Plus, the list is something useful you can share with friends and family! I also think it's smart to set aside money for future repairs and improvements. One common financial rule of thumb is to contribute 1% of your home's value to a dedicated “home maintenance” savings account each year. After Kim and I are done with this initial round of work, we'll probably do so. The deck and hot tub project should be our final large home-improvement expense for many, many years. During the past eleven months, we've repaired and/or replaced every major system in this house. Sure, there's still some small stuff that needs done — we want to paint each room, for instance — but these jobs are minor. They're things we can do ourselves for cheap. Honestly, I'm looking forward to some peace and quiet. It's been exhausting to live and work in a construction zone! First, though, I'm going to have our house inspected again. After plowing so many resources into repairing and renovating this place, I want to have a neutral third party go back through to make sure we've addressed all of the important issues — and that these issues have been handled correctly. As frustrating (and expensive) as the past year has been, we don't regret buying this house. We love it here. We want to continue loving this place, which means we're going to do our best to stay on top of maintenance and home improvements. We're going to do our best to be proactive homeowners. There are 28 reader responses to "The proactive homeowner: How to stay on top of home improvement". My brother is an architect with a 100-year-old house. Both our mother and our sister have used his contractors. We found our electrician on Angie’s List and our plumber by asking at the plumbing supply store. The plumber was not established, and I think the guys at the store were trying to help him out by recommending him, but he did good work. You get it fast, cheap, or good. Pick two. You’ll never get all three. Great info! I agree, about getting more than one estimate from a contractor. One HVAC contractor in our area was doing a lot of work in the neighborhood because the state was giving rebates. I had him come in to give me an estimate and he spent about 10 minutes looking around. My neighbor mentioned someone else he was really pleased with, so I asked him for an estimate too. He spent a full 90 minutes crawling in every corner of our house spotting wrong-sized ductwork, inadequate insulation and sealing, and answered every question I had. His estimate was not only cheaper, but gave me multiple options, depending on the equipment I wanted. Now, if I could only work on that spreadsheet! Good idea getting a home inspection after all the work. We get them every 5 years because you just never know what’s happening in the crawlspace or attic. We’re not willing to crawl around those areas ourselves. This intrigues me. I’ve wanted to get a home inspection just to see what a buyer’s inspector might find, if I ever do decide to sell. What has stopped me is a fear of the cost. What do you find is a fair price for your every 5 year inspection? And when you have them, do you tell the inspector it’s for a sale? Or just to be proactive? JD thank you for sharing your home ownership experiences. My home was built about fifty years ago and it had many deferred maintenance items that cost more than I had expected. The major repairs have now been completed. Sadly, I did not keep a home journal. However, starting immediately my goal is to follow your lead in keeping a repair journal and creating a home maintenance saving account for future items. It was also good to hear about the success in selling you motor home. Please consider writing a final post detailing the costs of your year of travel around the USA now that you can net out the depreciation cost of the motor home. I enjoyed following your travels. You know, I should do a big article about the overall cost of the RV trip. I’ve published bits and pieces of that at various places, but haven’t done a complete write-up. We went with the most expensive contractor for our major renovation nine years ago. When we found major structural issues (previous renovations enclosed a porch, literally, in a way that none of its footings could be used) he didn’t charge us more to remedy the issue. “I promised you a price and I won’t change it.” He did charge for other changes (we needed to replace a window not in the original score of work) but not anything related to the original plans. I’m sure he still made money, but that he likes the jobs where that doesn’t happen more. When you amortize the cost of a more expensive contractor over 20 years is a small cost that you probably make up anyway in lower maintenance and higher resale value. I used Angie’s List until I gave a low review for a company that misquoted an estimate (they left out labor costs???) and took over a month to rectify the situation. Angie’s List deleted my review once the situation was resolved — because they argue that a contractor who fixes a problem shouldn’t be penalized with a negative review. Terrific advice. Especially on the contractors. It took us a number of years to find the plumber who loves his work, the electrician who is a real expert, etc. It’s worth it, once you assemble the A Team. Financially…fixing up an old house is a little like childbirth….you’ll forget the pain as time passes, and you’ll so enjoy the benefits. I can’t wait for the photos of the Hot Tub Inhabited! Starting a list of trusted contractors is a great idea. I’ll do that. It’s so difficult to find good helps these days. Everyone is super busy. We have a ton of work to do on our duplex too. We’ll just tackle them a little at a time when we move in. It’s too much work to get them all done at once. Nice job! Your home looks great now. Enjoy the new hot tub. Another place I go to for recommendations is NextDoor. Best place to get recommendations for contractors that work in my neighborhood is from local neighbors on the list. I also have learned who to avoid from reading NextDoor posts. I don’t use Angie’s list anymore since I’d found iffy service with one contractor and they took down my poor review of a plumber that took short cuts, refused to correct issue that arose and I had to pay another company to completely redo the main line from house to the street. I don’t trust Angie’s list to be accurate. Ok no but seriously, you probably don’t want to be broadcasting the issues of your house to the world on Github. I love the idea of a house maintenance journal. I bought The Best House In Melbourne two years ago, and it was in pretty good nick, but there are still some things that I want to keep on top of. This is an idea I’ll pinch, because I’m really good at procrastination. My major landscaping work began yesterday. My backyard is totally gutted and soon I’ll be looking at brick paving everywhere, with wicking veggie beds and a huge roof under which I’ll be lolling about on a comfy couch reading books and sipping shiraz. A hot tub sounds good, but I’m 5 minutes walk from the beach so I figure I don’t need one. Enjoy the completed renos! How about a pic of your “English cottage”? I thought you lived in a “tiny house”. Would like to see what your “real”(my quotes) house looks like! We’re retired and have too much space, but until I read you, I wanted more! Keep the inspirations coming! I’m glad you guys are installing the hot tub! Can’t wait to see the finished result. You’ll probably live in your home for the next 20+ years. If I were ever to design a house from scratch, I would unabashedly put access panels everywhere. They can be hidden behind wood paneling (those swank 1970’s wood panels were onto something! ), and if you have more of an industrial personal style, it could just metal cabinet doors. Or they can be easily hidden higher on the wall with framed art. I don’t understand why houses were ever designed to have to be partially demo’d in order to fix critical components; then the additional cost and labor of having to fix what was destroyed. Makes no sense. I am thankful that my house has a good sized crawlspace, and it’s often commented on by repair service people that come over; they are relieved. Burying plumbing in concrete blows my mind. Not only does it make it easier and cheaper to have work done, but it makes it more possible that you can diagnose and possibly corrected issues yourself as well. It’s less daunting if all you need to do is pop off a panel, or open a door. I would be done having a plumbing/electrical closet as well….kind of like those solar battery storage closets where many major repairs can be done from one area. I agree on the plumbing and hvac set in concrete. Drywall is one thing, but digging into concrete for a leak?! For that reason, I decided not to finish the wall where my washer and dryer live (it’s in the basement, in any case). That way, when I’ve had to change a couple builder-grade connections, all it took was changing the connection – no new drywall, no mess. We have gotten good referrals from our local hardware store, also. The little ones work hard to develop relationships with home owners and contractors. My husband and I are not handy, but we wish we were. We sold our house last summer, it was built in 1975 and turned out to be kind of a money pit because we wanted to make it nicer and make improvements, but we were work full time and are not handy, so had to pay contractors to make the improvements. We must have put $100,000 into that house that we never got back when we sold it, although the improvements might have made it sell faster. How can you tell which improvements are required to keep the house up, without overdoing it? For example we did a kitchen upgrade- just cabinets, countertops, and floors, for $20,000. 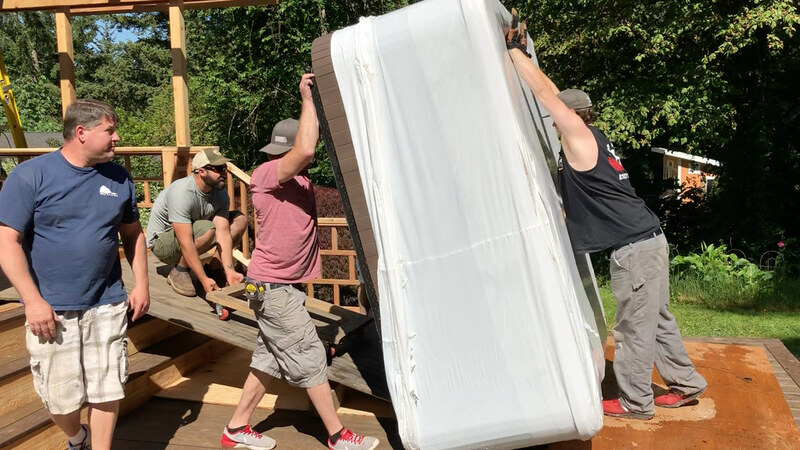 We finished the daylight basement to add 800 square feet, but then had to do foundation work and add a drain/sump pump system to prevent the repeating floods for another $20,000. Maybe this house wasn’t worth improving? It had views and backed up to forested land, in a pricier zip code than the surrounding towns. I do the same thing as your journal and I include as much information as possible, including who did the work, point of contact, phone numbers, etc. This way if something happens, everything is in one place and I don’t have to go searching. Last year, we had a tree snap and break a small section of our fence. We could easily look at our journal, find the contractor who did the original work, and get started on the repairs without a lengthy search. This will have a financial payoff too down the road, anything that’s an improvement (like our fence) will increase the cost basis of the home and reduce our taxes (assuming gains exceed the threshold or if the threshold changes)! Will you have the house reassessed after all your improvements are done? I think in my state you can appeal your property taxes if the town assessment is more than 10% off from your property’s actual value but I don’t know if it works the other way. With all the improvements you’ve done I’d expect a big jump in the home’s value. JD I love this website and have read your articles for several years. But I think you probably would’ve been better off financially by just buying another house or building one from scratch. But hey, as long as you and Kim are happy, that’s all that matters! Hey, believe me — the thought has occurred to me too! Great article, thanks. I live in New York City and have given considerable thought to the idea of moving to the suburbs. Presently, I pay a “cheap” annual maintenance of $1000 per month. I’m afraid of devoting my weekends to the never ending repairs and constant maintenance. I’d like to do other things with my time and with my family. To tie up hours and days every week for planning and managing all these projects concerns me. With houses there is always something that needs repair or maintenance, year after year. Yes, the end result is amazing. Nothing like a beautiful, well kept house….but at what cost to your schedule? That 12K I pay for maintenance insulates me from worrying about roof, plumbing, foundation, etc, etc. Ideally, I’d like to keep the apartment and buy a house in the suburbs, but most likely I will have to choose since keeping two homes will just be very expensive. It’s a tough decision, but one I will have to make at some point given the needs of my children.